Douglas-fir is a straight grained and resilient timber with high strength-to-weight ratio. Its light rosy color is set off by a remarkably straight grain pattern, making it a premium building product specified by architects, engineers and builders for a wide range of construction applications. Douglas-fir is also valued for its dimensional stability, strength and high specific gravity which provides excellent nail-holding capability. Sound Cedar offers Douglas-fir lumber that is either green (unseasoned) or kiln-dried. We stock and custom order or mill Douglas Fir for any job capacity in lengths up to 40' long. Douglas Fir is the most abundant softwood species grown, harvested, and manufactured in the Pacific Northwest. Douglas Fir is manufactured into hundreds of products that are shipped world-wide and is considered the most versatile of softwoods with many uses. Douglas Fir items we stock include our full line of kiln-dried, Douglas Fir timbers (resawn or surfaced,) and our kiln-dried, premium grade dimension lumber and kiln-dried, appearance grade, Douglas Fir boards. Surfaced on the back and edges, the face is texture resawn making these boards an excellent choice for trim, fascia, soffits and siding when fine appearance and durability are required. Clear Douglas Fir finish is highly valued for its strength, durability and fine appearance. It is manufactured into a variety of high-end products including flooring, paneling, millwork, doors, stepping and finish lumber. The natural beauty and warmth of clear Douglas Fir is always in style and will provide years of enjoyment and satisfaction. Our timbers are dried in state-of-the-art conventional kilns that utilize a computer-controlled low pressure steam system. AG Douglas Fir boards are kiln-dried for stability. Warp, cup, twist and checking are minimized. The face is texture resawn for a fine appearance. The knotty stock is selected for its appearance and sound, tight knots. 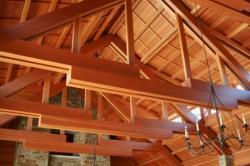 Clear finish lumber is kiln-dried for optimum stability. Warp, cup, and twist is minimal. Douglas Fir is easy to cut, mill and rip with regular woodworking tools. AG Douglas Fir boards will accept all kinds of paint or stain. Douglas Fir will work for interior or exterior applications. Great for trim, fascia, overhangs, soffits or rustic-look siding. All AG Douglas Fir is harvested from sustainably managed forests. Clear Douglas Fir is an excellent choice when the finest appearance is required. It is available in many sizes and patterns and can be used for all interior finish applications. Window and door trim, flooring, stepping, wainscot, wall paneling, doors, shelving, molding and millwork. Dimensionally stable and known for it's high strength-to-weight ratio, Douglas Fir is a great choice for many interior or exterior projects and Sound Cedar has all popular grades and millings available.